Algar do Carvao exceeded my expectations on my only visit there so far. 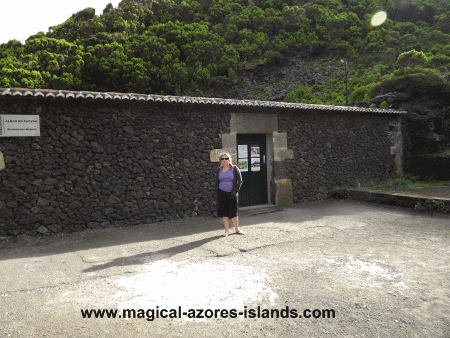 In fact, I might have skipped it altogether based on what little most Azores guide books have to say. One of the better descriptions simply says it is "formed by several caves, with about 100 metres of profundity, plenty of wonderful stalactites and stalagmites." 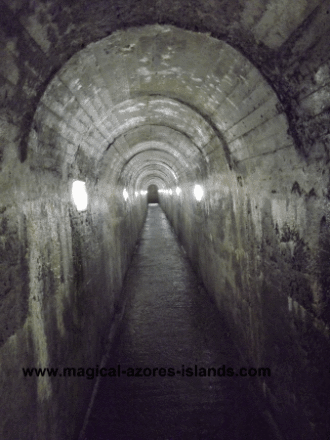 If it wasn't for a cousin from Sao Miguel telling me that it is worth a visit I probably would have spent more time exploring somewhere else instead of going underground. 100 meters doesn't sound like a lot when you read it, but when you are 100 meters underground and go down so far you can't see sunlight anymore, it's actually alot. The building, pictured below, is the entrance to the caves. There is a ticket booth, gift shop, information area and washroom area. Nothing fancy, but comfortable and convenient enough. When you look down at this point you will think you can see the whole cave, but the fact is that there are many levels and flights of stairs to descend to get to the bottom. There is a small fee to get in.